Yep, we’ve got another takeover for our latest blog post. Janine from Dilys Treacle Treasures has rounded up some of her fave Summer dress bargains, onward! These last few weeks have certainly been a bit of a rollercoaster ride in terms of the weather, haven’t they? It feels like autumn is on its way before summer even had a chance to get going properly! If you haven’t even started thinking about your annual leave yet, or if you’re planning on taking a late break, then the good news is that there are a wealth of summer dress bargains available online. It’s all about knowing where to look, and that’s what we’re here to help you with! If you’re after designer labels or unusual affordable fashion pieces you won’t find on the high street, then check out our quirky collection of favourite summer dresses we’ve put together for you, and discover our recommendations for the very best online boutiques around. This short length floaty silk dress from Anna Sui is divine, and it’s now on sale at CoChineChine with an amazing 50% off the original price. Featuring an all-over floral print on deep purple, with a v-neck, it has a gathered effect above the bust, with a shirring detail at the waist, a back zip fastening and a full skirt. We love this piece for its chic summer feel. * Farfetch.com is an online marketplace for independent fashion boutiques globally. Boutique partners are handpicked for their forward-thinking taste and unique viewpoints on fashion. You can shop from any boutique within the Farfetch network and get your order delivered to your door direct from the boutique itself. This cute amelie burnt orange dress by Brighton based label TBA, has a slim fitting silhouette to the waist, and features a pleated skirt and a mock bib with button detailing through the chest. The focal point is the large beaded collar, and the dress is finished with stylish ¾ sleeves, a small keyhole button to the back and a side zipper fastening. We love this piece for its eye-catching embellishments. * The Unconventional is an independent online boutique showcasing some of the most exciting underground and emerging talent. Offering a virtual space to house collaborative collections from around the world, a juxtaposition of artisan craftsmanship and avant-garde collections creates the subtle foundations from which The Unconventional was created. 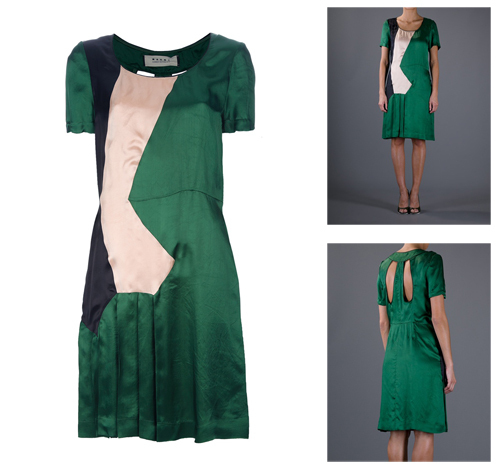 A gorgeous dress with a fun summer feel, this chiffon hem dress in jade & rainbow is by quality fashion label, LOVE. The nipped in waist, deep scoop neckline and delicate edging, teamed with a full skirt, create a wonderfully fanciful look, which will be on trend right through to the autumn. We love this piece for its bold colour detail. * Kuji Shop is an independent online boutique based in Sheffield, providing an ever changing art and design lead oasis of unique fashion brands, accessories, collectibles and gifts. 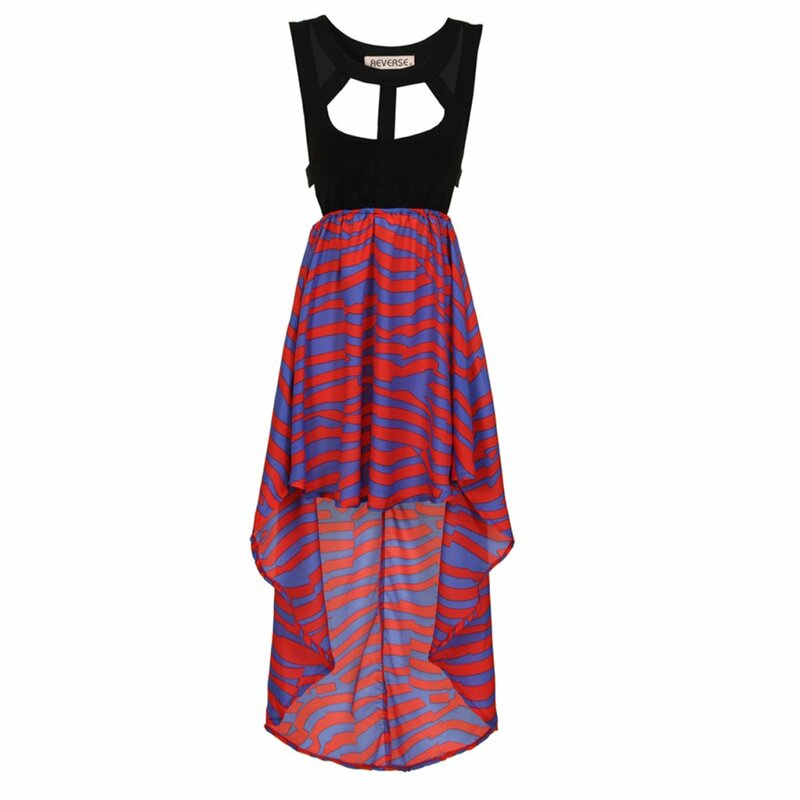 This gorgeous cut-out harness dress by Reverse features a striking blue and red ripple dip-hem skirt, with a nipped in waist, which is complemented by the black cut out top. There is very little need to accessorize… the dress says it all! We love this piece for its statement look! * Curiouser & Curiouser are an independent ladies fashion boutique located in the Northern Quarter area of Manchester. Selling cutting edge clothing by young independent designers from the UK, Japan, Korea, L.A. and Australia. Most collections are limited edition only, with some one-off pieces. Ok, so this is a skirt, not a dress, but who can resist a skirt with optional tassels?! This unique short-length piece, from London-based Key Lime Pie, features a bold graphic design and comes in two colour ways – ruby or lemon. For those amongst you with more extreme tastes, choose your tassels at the checkout. For a classic approach, hold the embellishments and go tassel free! These amazing skirts make a real statement and we guarantee you’ll be wearing yours long after the sun goes in. We love this piece for its bold print and optional tassels! * London-based Key Lime Pie was formed out of a shared love of making, baking (and a bit of booty shaking). A few crafty Sundays and banana breads down the lime, those people from KLP thought other people might like some of our creations, so they decided to share them. You can’t get more summery than this! This luxuriously fabulous floral dress from Yves Saint Laurent now comes with 40% off the original price tag, and ships all the way from Al Duca d’ Aosta boutique in Venezia, Italy. The dress features short puff sleeves, a v-neck, pretty bow detailing at the chest, a bold yellow and orange floral print, and a dropped waist with a short skirt which falls with curtain effect detail. We love this piece for its hot floral print and classic feminine shape. A simple yet undeniably stylish sports dress, from The Kooples. 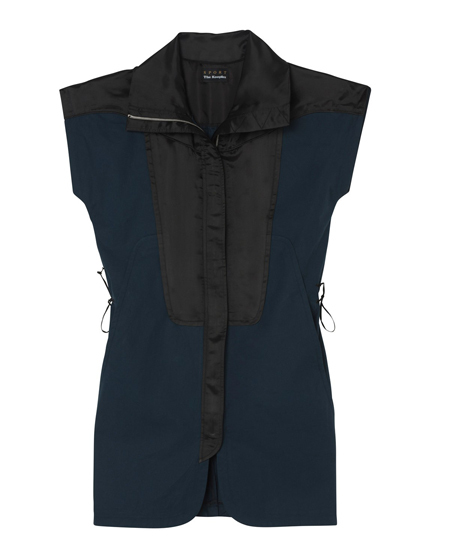 This sleeveless summer piece comes in crisp night-blue poplin and black nylon, trimmed with a black mesh yoke. The dress fastens with a zip to the front, and features tie-detailing to the sides. We love this piece for it sophisticated sports feel. * The Kooples is a French online boutique. Think Saville Row meets Parisian chic! Beautifully elegant and perfect for any summer ball, this racer-back dual fabric maxi dress by Cambridge-based Supremebeing™ comes in two colour ways – taup and black. The wave dress features a gathered skirt with sheer overlay and jersey liner, welt side seam pockets, a vented hem, and a centre front tie to finish. We love this piece for its elegance. Two Birds brings you this amazing long line slouch tunic dress in a fantastic geometric print. The perfect casual summer dress which is so versatile, you’ll find heaps of ways to wear it. Super flattering and with a print to die for, the 100% soft drapey rayon is ruched at the seam on each side to create the fabulous slouch effect. We love this piece for its versatility – wear it right through to autumn. * Hertfordshire-based Sands Boutique was founded by Susie Bennett and Sinead Woodley who are long-time friends, united by a consuming passion for fashion. Sands Boutique is for women who love fashion and who want to stand out from the crowd – without spending a fortune. We love this piece for its unique detailing. Why not have a click-around and see what else you can find for what’s left of this summer? Which is your favourite bargain? Let us know in the comments! This entry was posted in SALE and tagged bargains, boutiques, designer, fashion, fashion dresses, independent, print, shopping, style, summer, womenswear. Bookmark the permalink. 1 Response to Best Summer Dress Bargains!